The wind kept waking me up throughout the night; as many times that I’ve slept in a tent, benign noises can still play tricks on me. This time it effected my dreams, and I woke-up screaming after a giant tried to get me. Despite the rough night, I was glad to still feel energized to hike the next morning. 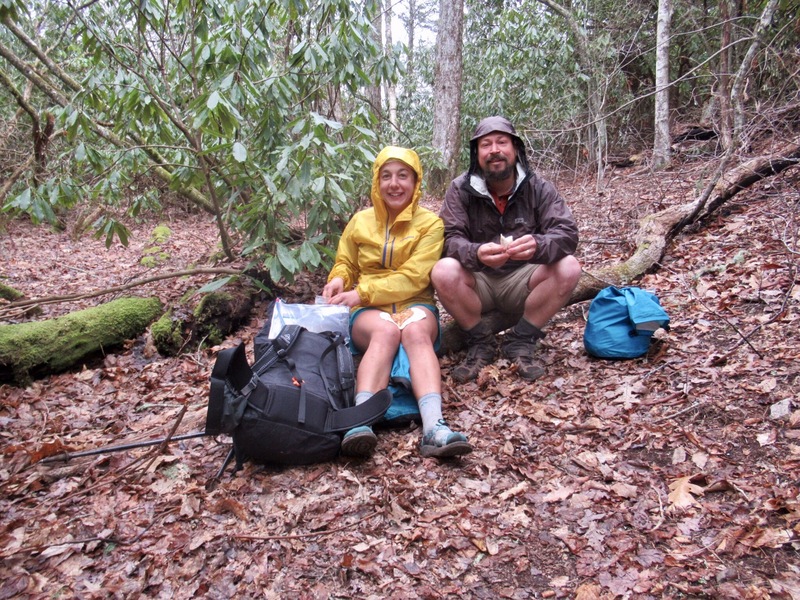 It was windy and cold again, so we hurried-up eating our hot breakfast and started down the trail to warm-up. Garrett and I made a plan that if I giant ever does try and get me, I’ll run first and he’ll follow. These are the things we talk about while we’re hiking. That morning we also devised a “hobble scale” to judge how sore our legs and feet are, and started talking about town food we’d like to eat. All and all it was a productive morning, made even more so by the fact that we made it to North Carolina! After the state border we had a characteristic AT steep uphill climb, only to head downhill again. We don’t mind, it would be boring if it was just flat the whole way to Maine. Around 6pm we were nearing a shelter and thought we may get lucky and find a spot. We’ve noticed many hikers seem to be stopping around 4pm to camp, while we tend to hike until 6 or 7pm (making finding a spot at popular spots such as near shelters and water challenging). We figured that the shelter would be full, but the tent sites were too. Fortunately we still had some gas in our tank, and the last 1.5 miles to the top of Standing Indian Mountain were surprisingly gradual. We had the tent site to ourselves, and despite sleeping above 5000ft it wasn’t too windy or cold. The next morning we awoke in a cloud, and spent most of the day in the mist. We’ve started taking a picture of a blaze each day, it’s our “blaze of the day.” Half of the fun is waiting to find an interesting white blaze, and there are plenty of them along the trail. 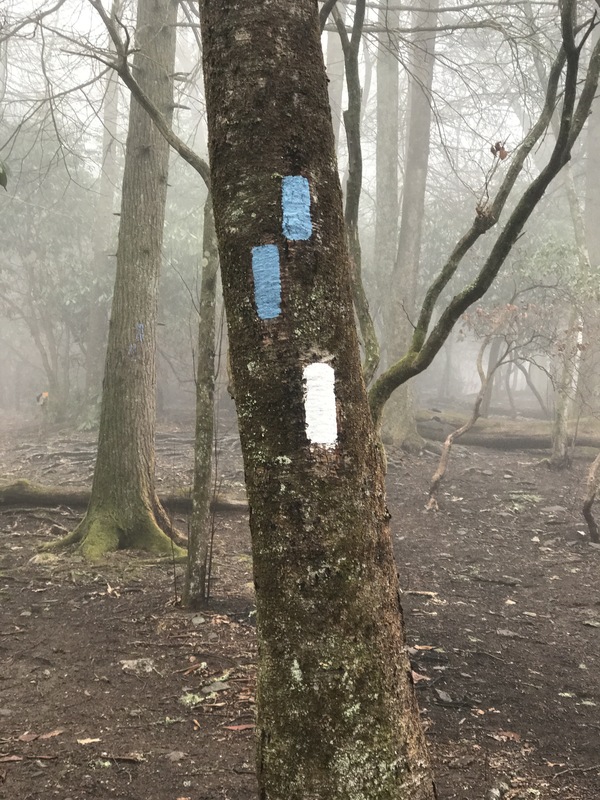 The one above indicates that the AT goes straight, but there is a blue blazed side trail that veers off to the right. We weren’t sure if we’d make it to US 64, 22 miles away where we could hitch into Franklin to resupply, but we were hopeful that we’d make it. Most of the day was gradual and we took a lunch break at noon with about 12 miles left to go. The next few miles had the steepest section of trail we’ve seen yet on this trip. Since I’m only 5’2 (on a tall day! ), some of the steps were too big for me and I had to use my hands to help pull me over the rocks. 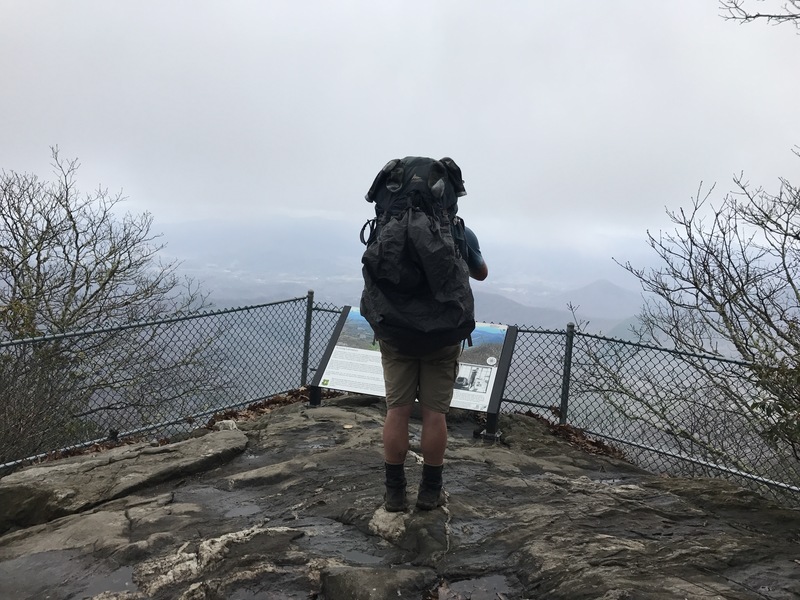 This is the type of hiking that made me fall in love with the AT when I was 18, doing a section hike in New England. 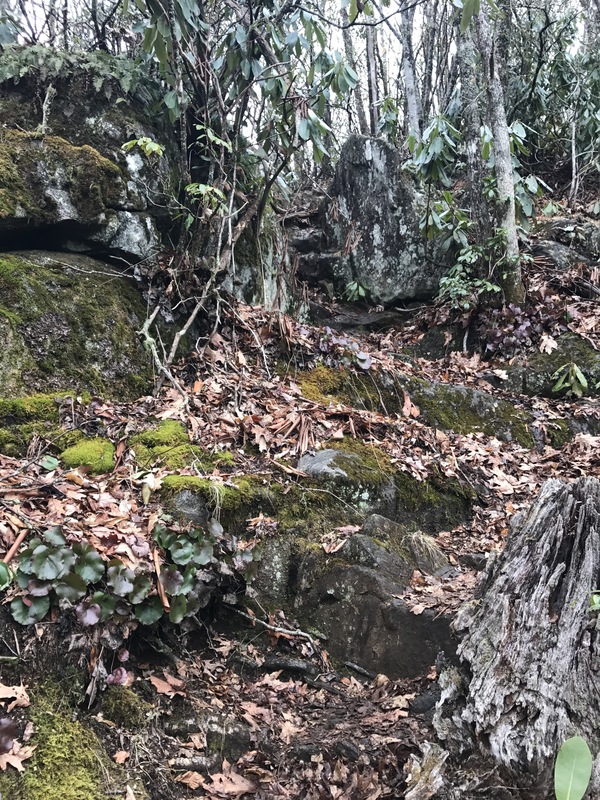 Eventhough I’ve never hiked he AT in Georgia or North Carolina, there has been something unmistakenly familiar about it. 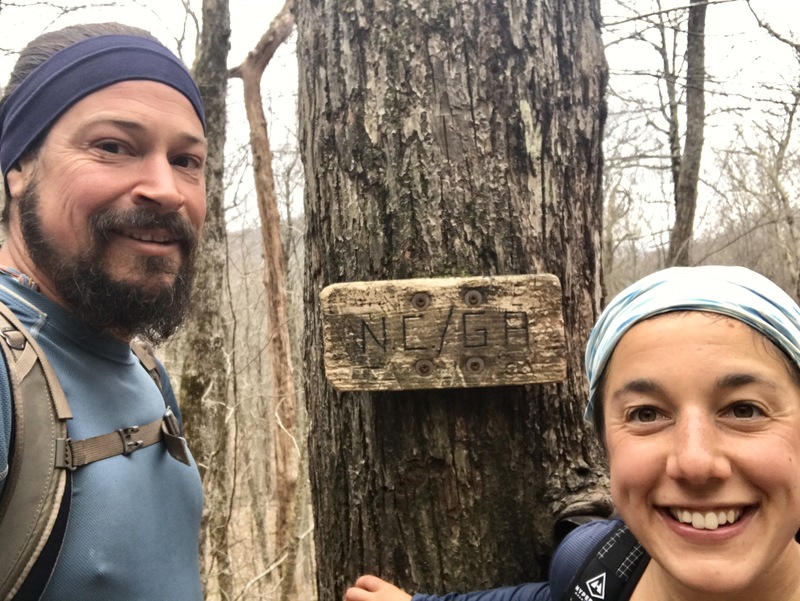 We reached the top of Allen Mountain in no time, and were optimistic we’d make the final nine miles to the road before dark. We called ahead to make accommodations in town, took in the view, and headed downhill. We moved quickly, and passed the 100 mile mark! The final challenge of the day was Winding Stairs Mountain, aptly named for the winding seemingly endless path it takes up and over the mountain. We exceeded our expectations and made it to the road around 530pm. We barely had to wait before a kind woman named BJ picked us up and drove us the 10 miles into town. She even waited while we checked into our hotel, then drove us to get BBQ (thanks BJ!). Afterwards we resupplied at the grocery store, and walked back to our hotel. The next day was spent lounging around, watching The Godfather II on TV, and resting-up. All and all we’re feeling really good, and cannot wait to get back on the trail tomorrow! We made it through okay!